Sybille Kuntz is rather a non-conventionalist in the wine-making industry of Germany. Based in Mosel Valley, she is a huge advocate of sustainability and has been producing dry, organic Riesling wines since 1990. Sybille’s efforts have not gone unnoticed, as she earned an Eco-organic certification in 2013 and Demeter’s biodynamic certification in 2016. The winery is also certified vegan. 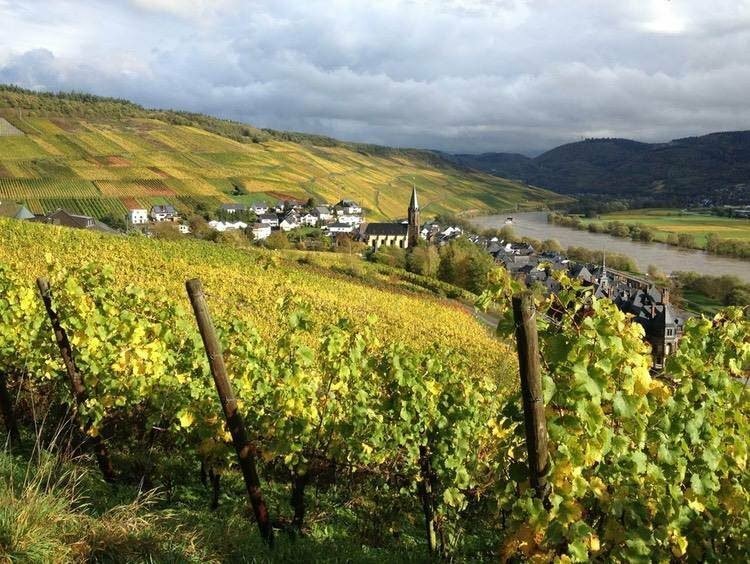 German wines are, in principle, classified by the ripeness of grapes and grown in, but not limited to, a specific 13 quality wine growing regions within the country. I find it interesting that all biodynamic wines are organic, but not all organic wines are biodynamic. A point that certainly isn’t obvious until you start to think about it for a minute. Biodynamic principles are not founded on black magic or alchemy but are more a philosophy of following the guidelines and signs within nature: the waxing and waning of the moon and other celestial bodies for example. Organic is based and rooted (pun fully intended) in science. It is pretty incredible to attend a wine dinner where there is not a single red wine on the menu. Nor is there a different varietal. 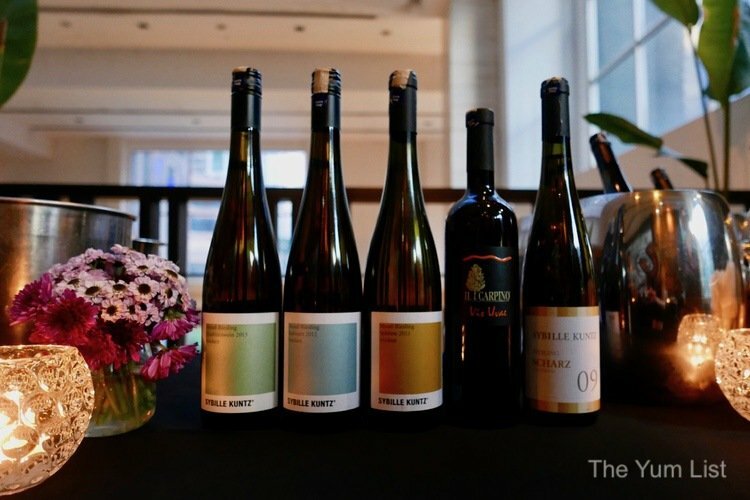 Every single wine is a Riesling, highlighting the ripeness of the grape, showing the complexity and versatility of a wine category (Riesling) that has been long ago damaged by its sickly sweet bottling ever present in hypermarkets around the world. Well, I keep an open mind and I was up for the challenge of an all dry Riesling wine dinner. The gracious hosts of the event at Skillet @ 163 were prepared for the challenge as well. Serving modern European-style dishes with undertones of Asian influence, the team are experts at creating flavour matches. 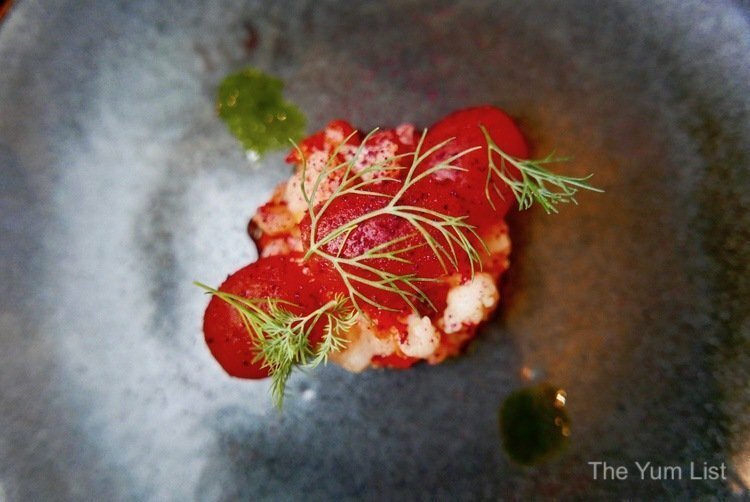 The dinner started with an amuse bouche of tomato confit, plum and bell pepper chutney and lightly pickled cauliflower, topped with fresh dill. A great way to get the stomach juices flowing! 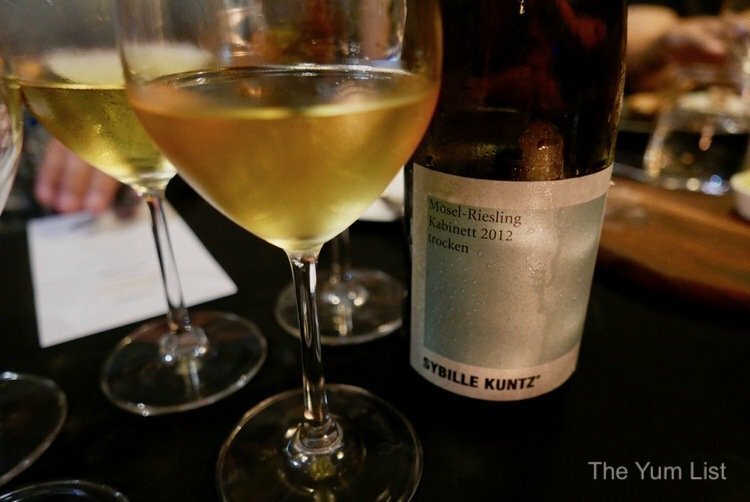 Sybille Kuntz Mosel-Riesling Qualitatswein Trocken 2013 was the introductory wine. This wine has a high level of residual sugar and is very soft on the palate. By definition, a wine can be labelled Trocken if the residual sugar is less than 9 g/L. Although I found the wine to be sweet, there was enough minerality to balance it as well as notes of grapefruit and stone fruit. 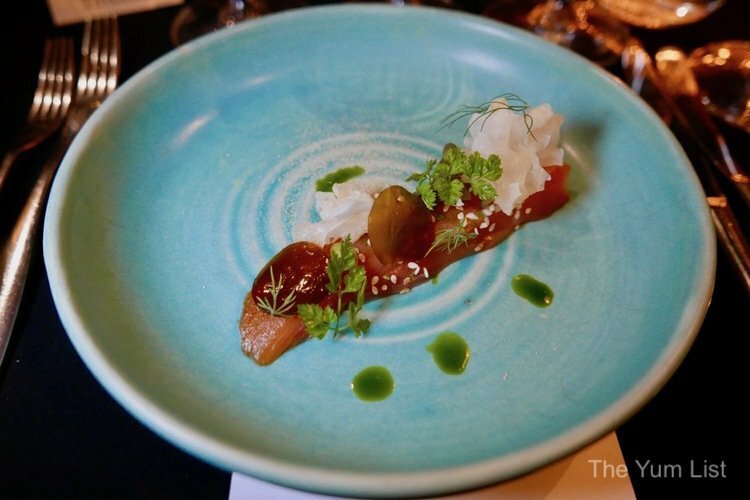 Home Cured Salmon with Seaweed and Soy was paired with this wine. Norwegian salmon was cured with sugar and salt for 24 hours, sliced fairly thinly and topped with seaweed and white fungus mushrooms. The balance of sweet, salty and slight earthiness of the dish paired as a nice compliment to the lighter side of the wine. 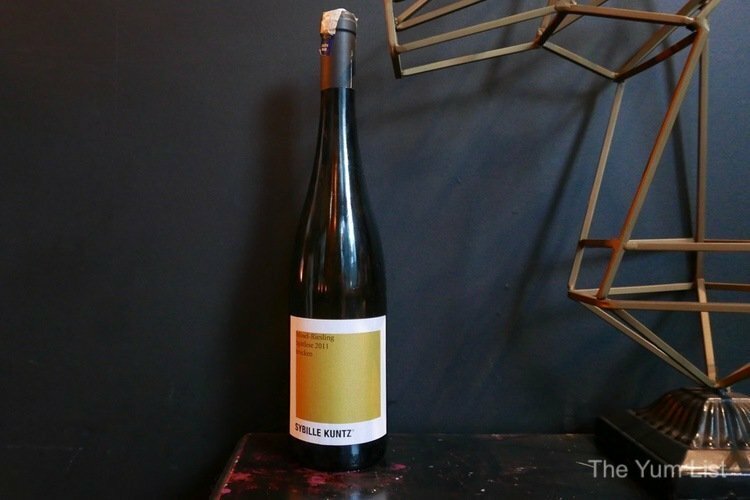 Sybille Kuntz Mosel-Riesling Kabinett Trocken 2012 falls under the classification of Pradikatswein. The Pradikatswein classification means that it is considered a quality wine with special attributes (the vines in this vineyard are between 40 and 60 years old). In the case of this wine, the grapes achieve minimal ripeness and produce a much drier wine. This is a single varietal wine that is much less sweet. The predominant notes were lime zest, stone fruit and an increased level of minerality. It is very vibrant in both sheen and taste. 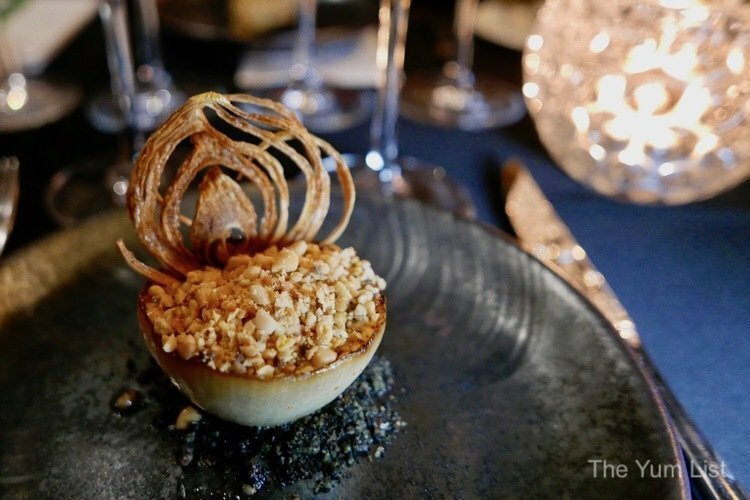 Humble Onion with Roquefort Cheese and Charcoal Soil was served as the second course. I think it was pretty daring and bold to serve a slow roasted onion with Roquefort cheese. The cheese was light enough to not overpower the wine or the onion. Mon really liked this dish. Sybille Kuntz Mosel Riesling Spatlese Trocken 2011 was the third wine of the evening. We continued our journey with progressively riper grapes. This wine is a Spatlese which translates to a late harvest wine. Leaving the grape on the vine longer creates more sugar within the grape allowing for the potential of increased alcohol in the final product. This is another single vineyard wine. This time the minerality I spoke about earlier was even more pronounced, leaving an almost chalky feeling on my gums. This wine is certainly more complex than the previous ones with notes of spice and ripe fruit coming through brightly. I like how the taste lingers on the tongue ending with a bite of grapefruit skin. Certainly my favorite wine of the night. 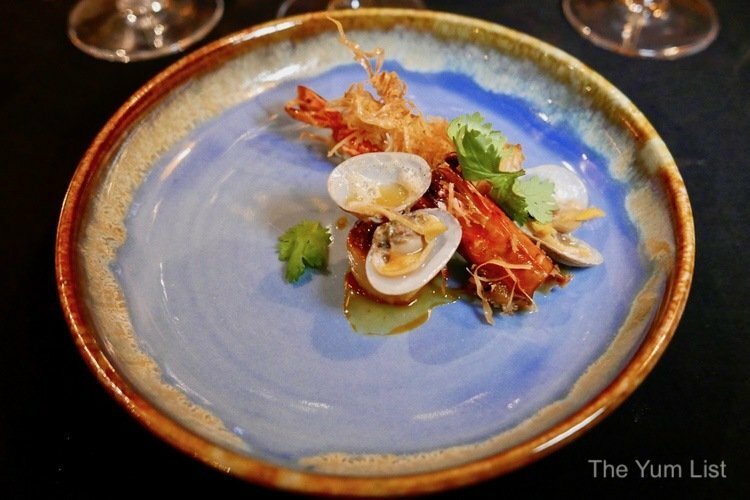 Crisp Tiger Prawn with Spicy Tom Yum and Clams was an innovative deconstruction of the classic Thai soup. Although it was served dry, it did capture the essence of Tom Yum Goong. The mildly spiced red curry paste in the dish made friends with the spice notes of the wine. 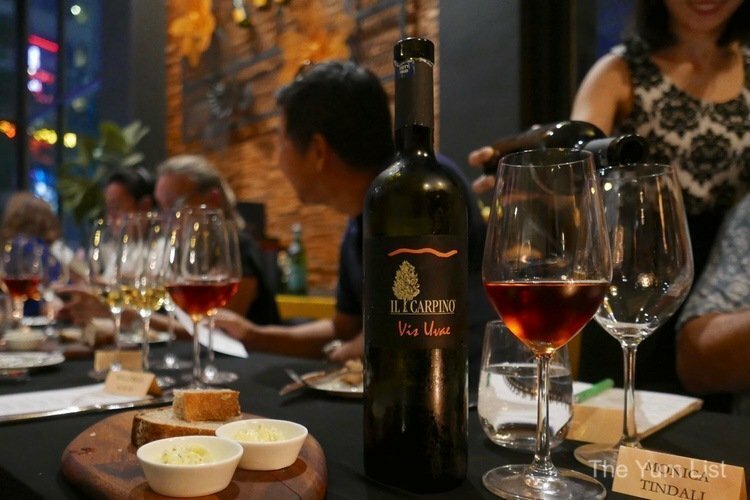 Il Carpino Vis Uvae IGT Della Venezia-Giulia 2011 is an orange wine. If you have never had one, I think orange wines are certainly worth seeking out. It is technically known as a skin contact wine made from white wine grapes using red-winemaking techniques. The skin is macerated with the grapes for about a week, creating the orange hue and also giving the eventual wine a tannic structure. Then the grapes rest in an oak barrel for a year. The wine is transferred to stainless steel containers and rested for 11 months. The final step is that the wine is bottle conditioned for a year before sale. The duo of Lamb Rump & Crepinette with Burnt Aubergine and Longan Jus was my favorite food course of the night. The house-made crepinette wrapped in caul fat demonstrated the skill of the chef. 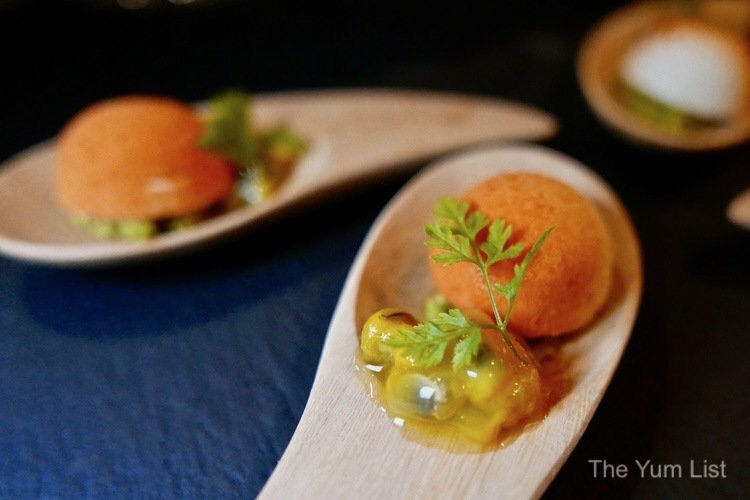 The jus was light and ethereal on the plate – longan and burnt eggplant were in harmony with each other. I thought this food course was brilliant and well executed by the kitchen. As much as I appreciated the wine and loved the food. I enjoyed them more separately than together for this course. Sybille Kuntz Mosel-Riesling Scharz Schiefergestein 2009 seems quite unusual to me because of the manner in which the grapes age. The grapes become infected with a grey fungus called, botrytis cinerea. This fungus affects grapes when conditions in the vineyard are wet and humid. If such conditions persist throughout the day, grey rot occurs and will result in rotten grapes not suitable to make wine. However, if drier conditions ensued in the midday after the humid mornings, noble rot takes place instead. Noble rot affects grapes in a good way where it concentrates the sugars in the grapes and also imparts favourable qualities to the grapes. I imagine the first person to harvest these grapes and make wine anyway was pretty hard up for a drink. But then again, many great culinary discoveries happen by accident or through a slight misfortune. The wine itself is surprisingly hearty and obviously more on the sweet side. White Chocolate Mousse with Peach and Jasmine Granite was an interesting dessert. I couldn’t imagine this combination of flavors. But I love to be surprised! 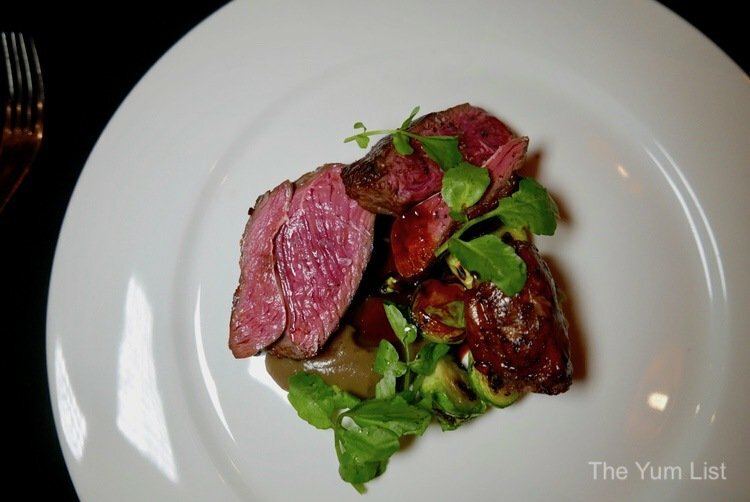 Once again, the chef demonstrated his skill in balancing flavors that when juxtaposed don’t necessarily make sense, but somehow find congruence in their pairing. I like this course with the wine. The wine was hearty enough in body and there was enough acidity to contrast the sweetness of the mousse. We finished the evening with a light petit four of coconut, passionfruit, pistachio and chervil. 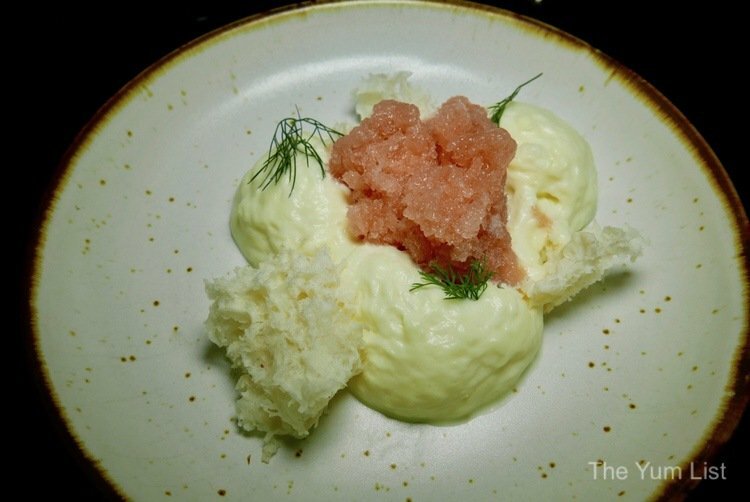 The small addition of the chervil brought this pleasant little bite to a new level of excitement. 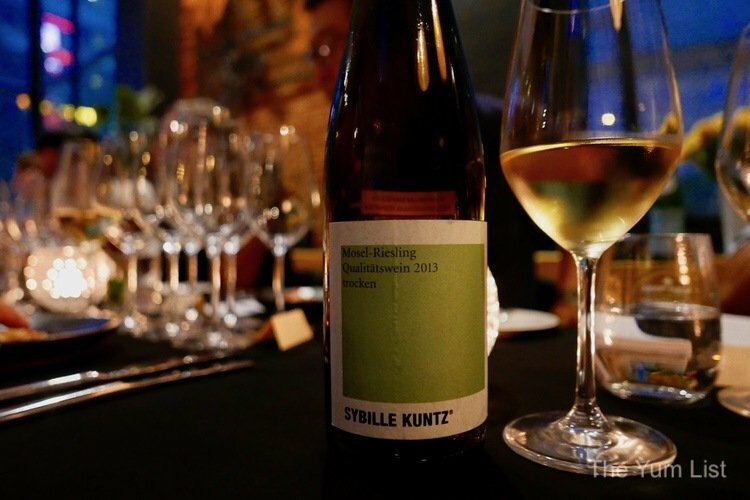 Reasons to visit to drink Sybille Kuntz Wine: A magnificent range of Riesling allowing you to refine the palate by comparing across vintages and styles; both organic and vegan; a great drop with many Asian flavors. 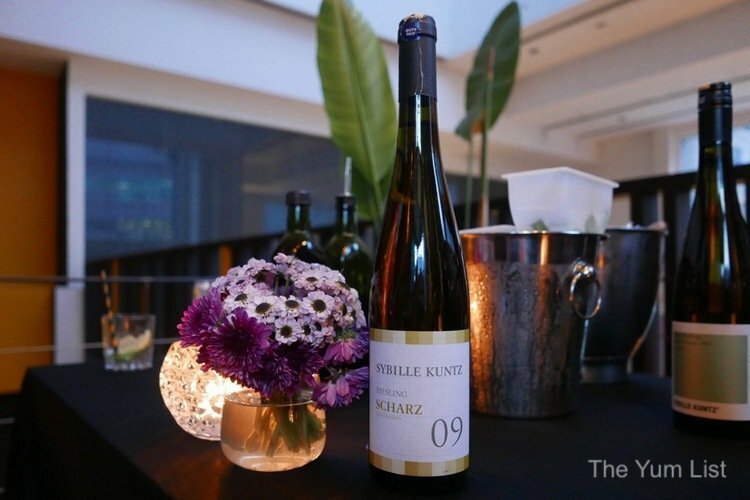 Sybille Kuntz wine is available in Malaysia through JJ Suppliers. More on Skillet at 163 here, here and here. 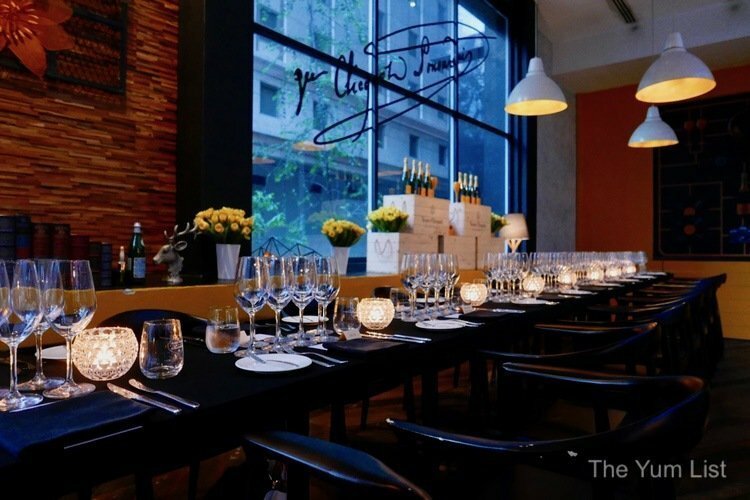 Also more on KL’s vibrant wine scene here. I see a bit of Thai influence there. What a gorgeous view of the countryside! I never would have thought Germany was known for wines. Thank you for the introduction. It amazing how , where , and what the wine business became. The lamb is lusciously pink!